Well, here's another copy/paste post coming directly from marcandangel.com, but I thought I'd post it in honor of Valentine's Day. I'M spending VDay alone...since my hubs will be on a flight back to Cuba for the next six weeks. But, I'm all proactive and signed up for a 5km race. It's going to be -26*C tomorrow. Hopefully, I'll only be outside for about 30 minutes...but I'm thinking that adding all those extra layers might add another 15 minutes or so. Then it's a hairdo, where I think I'm going to do something drastic. And then it's a bucket of ice cream... water, since I'm all health concious...and catching up on some TV with my furry little mutt, Mags. Who has been pretty much disgusting me lately, eating her poo on my watch almost every day. Yah. Come give momma a kiss...alright. That dog....ok, enough about my poo-eating-dog. The following exerpt is from the website www.marcandangel.com. I regularly get emails from their blog feed and I regularly DON'T read them. But, since I'm working on creating a healthier mind, spirit, and body (and this is no easy task), I thought I'd start reading them more often. Today's was an awesome read, because I'm not happy with a few things in my life. Some days I'm content, some days I'm positive, and other days...well, I think it's the end of the world. I feel discouraged and wonder how long it will take to get me feeling like I'm on the right track. Last night we celebrated Louis' big 50th birthday. 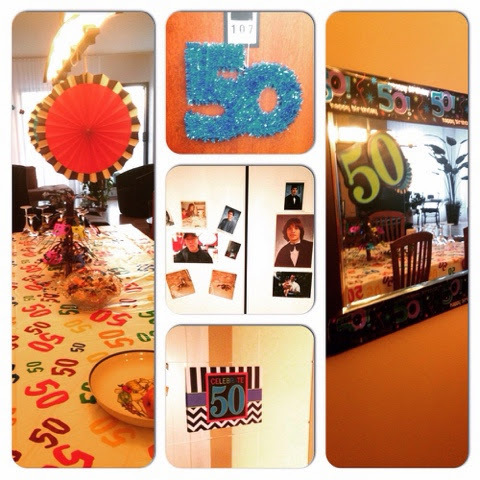 His birthday is a couple of weeks before mine, but his birthday is rarely celebrated...and it was a "the big 50" so I wanted to do something special. We spent the night with a pizza/beer/cake party with a big chunk of his family. The weekend before we all attended a very emotional funeral...and it was a great distraction to get together the week after in happy times. Laurie, Louis' mom, & I put up some cheesey decorations. Cake and desserts were had by all (except Louis' youngest who was at lifeguard training :( ). Missing my family like crazy....helps me a lot to be around a bunch of funny, loving people. Well, my weekend in Vermont has inspired me to start to be a lot more active on my weekends! This weekend, I’m helping to host a birthday party for Louis at his mom’s place. I’m very excited to shine some attention on someone that deserves some special recognition. He is always everything to everyone….and I hope that he gets his day in the spotlight (even though he’ll hate being in the spotlight) for him to be spoiled and loved on. Being an expatriate means celebrating your birthday far from most of your friends and family….so I wanted one special year where this isn’t the case (even though his birthday was on the 23rd).